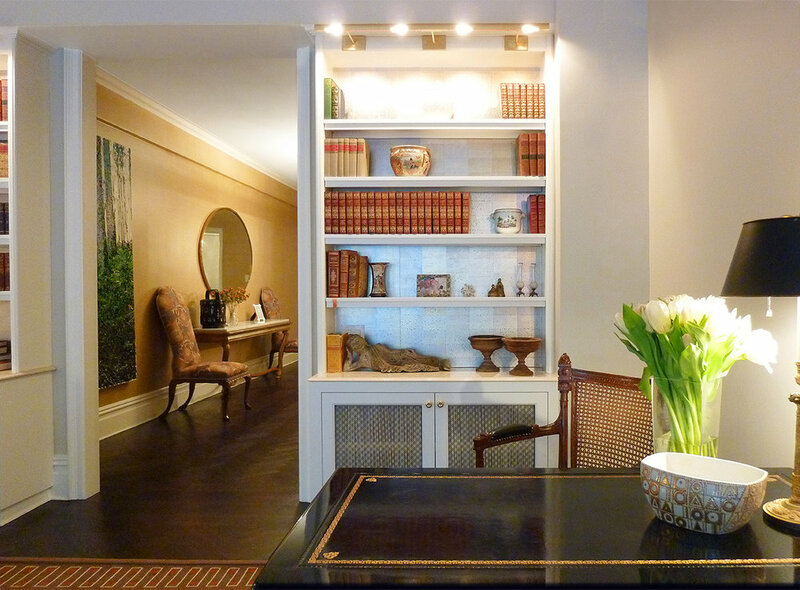 A full renovation to reproduce an elegant detailed apartment was needed for a client moving from a spacious Connecticut home and into the more crowded Upper West Side of Manhattan. Like most empty nesters, a change of scenery was desired. So moving from the spacious homes of Connecticut and into Manhattan in the Central Park West area sufficed this desire for the owners of this newly renovated space. A full renovation proceeded to reproduce an elegant detailed apartment with paired down upholstery and drapery in rich brick, brown and silvers. A daring library in deep avocado lacquer is tamed by comfortable upholstery, a custom rug from Beauvais and a classic paisley velvet.